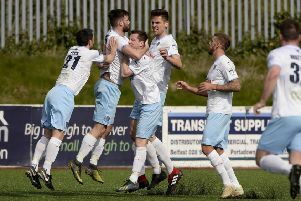 Ballymena United manager David Jeffrey is sure Portadown will come to the Showgrounds on Saturday with a point to prove in the Danske Bank Premiership. Jeffrey knows the Ports will be hurting - because as he was watching his side losing4-0 to Coleraine in the quarter-finals of the Irish Cup - Portadown were on the end of a 5-0 hammering to Glenavon on their home patch. And Jeffrey expects Portadown manager Niall Currie to have his troops primed and ready for the encounter. “Everything that Portadown would have got in the Irish Cup would have been a bonus. “They are only interested in the league and Niall Currie will have them fired up. “They will be disappointed with the result against Glenavon but experience would tell me that after a 5-0 defeat Niall Currie will looking for a response from his players and this is the league and that is more important to them. “And we have to remember they went to Windsor and did very well against Linfield. “They also played very well against Crusaders and according to Stephen Baxter Portadown should have beaten them on the day and he was quite relieved to get away with a point. “Don’t let their league position fool you - they will be coming here to do a job on us. “From now on every point from now on will be treated like a prisioner. “Every team in the league will want something from every game, so we have to be ready for that,” he added.